Your local Pokémon Mart is great for quick shopping trips, but if you want to talk about selection, nothing beats the Celadon Department Store. With five floors of everything a shopper could conceivably desire, it's a must-see for Pokémon trainers. Fight the crowds to stock up on supplies and perhaps even solve a few of your ongoing problems. They don't get any bigger than Celadon City. This Pokémon megalopolis is home to the massive Celadon Department Store (a much bigger version of a Poké Mart) where you can buy all sorts of enhancements for your Pokémon and items to help you on your quest. Make sure you also check out the far right side of the town. When you walk over, you will see a bunch of trees that lead to a dead end. Go up as far as you can go until you hit a tree. 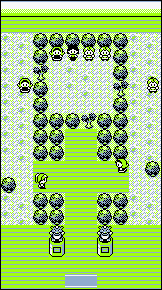 Inside that tree is a PP Up, which increases a Pokémon's move's PP slightly (can be used a maximum of three times per move). Southwest of the city you'll find the Celadon Gym (the place where you can get the Rainbow Badge), and a casino that's home to Team Rocket and their secret Pokémon trafficking operations... And in charge of it all is the shadowy figure of Giovanni, the man who's currently in possession of the Silph Scope you've been looking for. Once you gain the Surf ability from HM03, you'll be able to float across the little pond in the center of town on a Pokémon's back. You'll receive TM41 (Softboiled) from the private resident. Not a bad reward for a short swim, but you can only teach it to a Chansey. Softboiled restores half of the user's maximum HP, but you can also use it outside of battle to restore some HP of another Pokémon in the party, at the cost of its own HP. 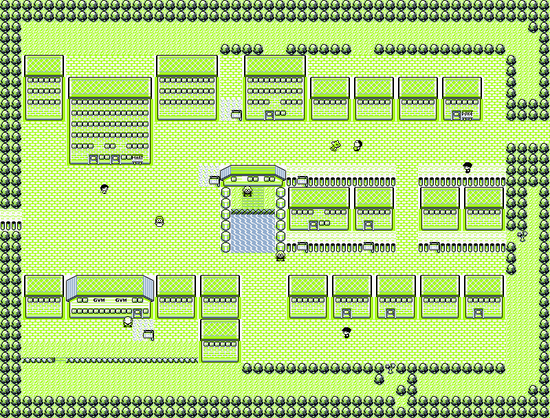 The large building in the top-center of town (to the left of the Pokémon Center) is Celadon Mansion. The mansion's current tenants are none other than Game Freak, the team that developed Pokémon! The team leader promises a reward if you bring him a completed Pokédex (meaning all 151 Pokémon were collected), but you can get your hands on something right now if you sneak in the back and up to the top floor: it's an Eevee, the only one in the game you can get normally (your rival has another one in Pokémon Yellow). Since you can power it up with the Stones available in the Department Store, it should be a powerful addition to your roster but since it starts at level 25, you're going to have to train it up quite a bit. Something fishy is going on in Celadon City, and it's your job to find out what. If you can't put your finger on it at first, start your detective work by grabbing a bite at the local diner and see what turns up. Some might point you in the right direction, others would mislead you. Of the two side-by-side buildings at the bottom of town, the building on the left is the diner. Next door to the diner is a warehouse operation that's shipping over 2000 Pokémon a month, with most of them being used as prizes at the Game Corner slot arcade. Big numbers mean big money, and that has Team Rocket written all over it. Team Rocket is obviously up to something, and as the dimwit in the warehouse points out, it surely has nothing to do with the hidden switch in the poster guarded by a Rocket in the Game Corner. And as long as you're heading down to the casino to confirm the non-existence of the switch, you might as well do some gambling. Make sure that you get the Coin Case from the gambler in the diner next door. This isn't just another lame Poké Mart. The Celadon Department Store sells all sorts of things that can't be purchased anywhere else! Talk to every clerk behind every counter to see their entire selection. You may even receive a free sample! The 2nd floor sells not just the usual staples, but a variety of Technical Machines as well. Some of the exciting ones are TM07 (Horn Drill) which can be learned by any horned Pokémon (like Nidorans) and K.O. 's instantly if it hits. However, it only has 30% accuracy and the user needs to be faster than the target to work, but you can use a X Accuracy to help you. TM37 (Egg Bomb) which can be used by very few Pokémon, but is a powerful Normal-type attack. TM01 and TM05 are the very useful Normal attacks Mega Punch and Mega Kick which has above-average power but their accuracy is a little inaccurate (the kick is more powerful, but less accurate than the punch with an accuracy of 70%). You can give this for your Jigglypuff, Clefairy, and anything else that lacks solid firepower; and TM09 and TM17 are Take Down (Normal attack) and Submission (Fighting attack), powerful attacks that do a portion of their damage back to the user. Nothing's for sale on the 3rd floor, but the second guy from the right at the counter will give you a free TM18, containing Fighting-type Counter, a move which, after an opponent damages the user with an Normal or Fighting-type attack, the user will deal twice as much damage to the opponent that damaged it. It can also hit Ghost-type Pokémon. The 4th floor sells the Stones you'll need to evolve certain Pokémon. Grab a Thunder, Fire, or Water Stone for Eevee, and pick up a Poké Doll or two, one which will come in handy for something in Saffron City and one for something else later if you feel like doing a sequence break. The 5th floor sells ability-enhancers for battles, and a variety of expensive supplements. You can buy vitamins here, which will slightly increase a base stat of a Pokémon per intake. They come at a very expensive price however, so prepare a huge load of money if you fell like buying a ton of them. On the other hand, there are also X items too and they can come very well in handy for important battles such as Gym Leaders. Finally, there's the roof. Hit the vending machine and get one of each beverage to give to the little girl wandering around here. Give her the Fresh Water for TM13 (Ice Beam, which is a super good Ice-type attack to use and has a 10% chance of freezing), the Soda Pop for TM48 (Rock Slide, a powerful Rock-type move in the hands of a Pokémon that can get STAB off of it) and the Lemonade for TM49 (Tri Attack, a regular Normal-type attack). However, you can only get one of each TM, so don't think about giving her a ton of Fresh Waters so you can teach Ice Beam to many of your Pokémon or something. Also, fill up your bag with Lemonade! Like the other beverages, these can be used to heal your Pokémon. Fresh Water is the most cost-effective option, costing the least per HP restored! Also, compare Super Potions to Lemonade. Lemonade is the way better deal since it cost half of that of a Super Potion and it restores 30 more HP that it does! Stock up and save! Don't forget to buy an extra beverage for the border guards in order to get to Saffron City. The Game Corner offers some hard-to-find Pokémon (and one exclusive one), but at high prices. You need to exchange coins for them, and outside of the few hundred that you can bum from other gamblers or find on the ground, you can only get them by buying them at the rate of 50 coins for 1000, or winning them in slots. Or, you can march around the room pressing . Chances are, you'd get 10 coins at the very least. The slots are tricky. The machines do differ, but they go in streaks, changing frequently, so the only way to win is to spend all day putting a few coins into each machine, seeing which ones are "streaking," paying 70% of the time, and hold onto that machine until it runs out (you can usually get 500 or so coins out of them). Other machines retain poor odds (1 in 10 or so) but have frequent high-paying Bars and 7's. So if you get a Bar, stick with it for a while and a Triple-7 is probably ahead. You can redeem your coins next door for TM15 (Hyper Beam), TM23 (Dragon Rage) and TM50 (Substitute), as well some good Pokémon like Dratini, but they're hardly worth the amount of time you'd have to spend on the slots to get them. Save up and buy the coins if you're trying to catch them all. Here is a helpful tip to earn coins. Bet 3 coins. Count as accurate as you can from 1. As soon as you hit 3, press A once. As soon as you hit 5, press A again. As soon as you hit 7, press A one more time. You should get an average profit of 1.14 coins per spin. And you should win 38% of the time. For once, the real action in town is somewhere other than the Gym. You could either go after Erika immediately or wait until after you investigate the Game Corner and maybe get some training in. No matter which version you're playing, Erika's assembled a nasty team of three high-level Grass-type Pokémon to contend with. Erika and her Junior Trainers make for one of the easiest Gyms to defeat, since Grass-type Pokémon have so many weaknesses. The weakness to Fire is something Red and Blue players are in a better position to exploit, but everyone can take advantage of the fact that their own Grass-type Pokémon are basically invulnerable to enemy Grass-types. Of course, that goes both ways, so your Pokémon better know some non-Grass techniques to break the stalemate (such as Wrap, Cut or Take Down) or you'll be in for some long matches. Also if you've managed to pick up TM13, Ice Beam works great. You can also teach Ice Beam to your Water-type Pokémon to counter their weakness type although this might be not so effective, as Erika's Pokémon can still take a hit and retaliate with a high-powered Grass-type attack. Another type that's helpful against Grass is Psychic, due to the common secondary Poison-type, and if you don't have any strong Psychic-types, you should take this opportunity to get them some experience before you end up relying on them in the Pokémon Tower. Flying-type Pokémon also have a great advantage. Pidgeot and Fearow can use Wing Attack and Drill Peck. You can also use a Fire-type Pokémon, such as Vulpix, Growlithe and Charizard (who is also secondary Flying-type). While the game does say that Ground-type moves are effective against dual Grass and Poison-types, its actually false however, so the above options are better. Be sure to bring some Ethers or Elixers if you don't want to make repeated return trips to the Pokémon Center to refill the 10 PP. Victory earns you the Rainbow Badge, which allows you to command Pokémon that are as high as level 50, and TM21, Mega Drain, a rather low powered yet useful Absorb-like technique that can be learned by all Grass-type Pokémon and a small handful of others, including Gastly and Ekans. As Yellow players have learned from their many confrontations with their rival, Eevee, in its basic configuration, is not especially powerful, with not so great stats and sluggish movepool. But the good news is that you can use a Stone to power up Eevee into something much more powerful right away. It won't really keep Eevee from learning any good skills, and you can make Eevee specialize in whatever type your roster is lacking. Give it a lot of thought: this is the only Eevee you'll ever get, and if you want to complete your Pokédex, it is required that you use another game to get two other Eevee that evolve into the other two evolutions to transfer into the version you want to complete. The Water Stone turns Eevee into Vaporeon, the toughest of the Eevee forms on defense, but none-to-shabby on offense either. Water-type Pokémon are extremely valuable in the late game, and Vaporeon has one of the best Special stats of any Water-type. If you saved TM11 which contains BubbleBeam, Vaporeon will be immediately useful, and even more powerful soon after when you get the Surf (HM03). Celadon City even lets you access the Ice Beam (TM13), which will make Vaporeon a lethal threat, even to Erika's Grass-types that normally have an advantage against Water-types. With its impressive mix of defense and offense, Vaporeon is sure to make a huge splash! The Thunderstone creates Jolteon, one of the game's fastest Pokemon (about the second fastest). Jolteon's impressive Special and awesome critical hit rate (thanks to its Speed) make its Electric-type attacks truly terrifying. Make sure you saved TM24 (Thunderbolt) if you plan on using it. It has a few interesting coverage moves like Double-Kick and Pin Missile, but its Attack is so pitiful... just stick to blasting things with Thunderbolt and paralyzing things with Thunder Wave. Flareon is the red-headed step child of the Eevee evolutions, ever disowned by Gamefreak. Flareon comes with an incredible Attack stat, but all it can use it with are Normal-type attacks, and without STAB (which all Fire-type attacks uses the user's Special stat) it only hits about as hard as Raticate or Pidgeot. Meanwhile, while its special is good for the most part, it only gets the very weak Ember, and no better Fire-type moves until much later in the game. Defensively, poor overall bulk and low Speed gives it real problems both against strong opponents and over long routes, and Fire-types themselves aren't that very reliable in-game. By the time it learns Fire Blast or Flamethrower, there are almost no opponents Fire is good against. Unless you need the Pokedex entry or just feel sorry for it, you're best off passing up on Flareon. It's commonly considered the worst Eevee evolution of the three in competitive play, and maybe the worst of all of them due to it's said low speed and bad typing. Porygon, who can only be acquired through coin redemption, isn't the toughest Pokémon, but his trademark skill Conversion (which makes Porygon the same type as his opponent) has some interesting possibilities. It has a great movepool, thanks to TMs and its ability to sweep, but its stats are poor. Because it is always unreliable to gain coins by gambling; it is better to directly buy all the coins you need to get Porygon instead of trying to get it with slot machines. Porygon costs 6500 coins in Blue and 9999 in Red, which means 130,000 in Blue and roughly 200,000 in Red; and if you think about that, it is not that much, especially if you can go to Indigo Plateau and defeat the Elite Four, because you will need to defeat them only six times in Blue and nine times in Red. This page was last edited on 20 July 2017, at 02:49.